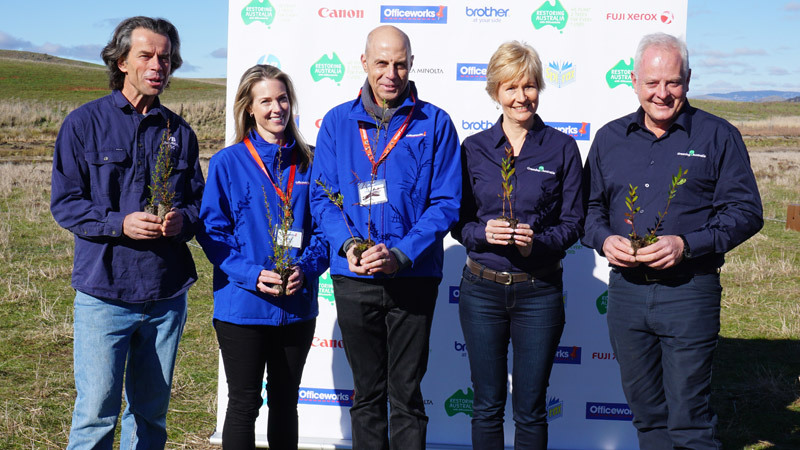 From 2017, we’ve partnered with Officeworks to deliver ‘Restoring Australia’, an Australian retail-first initiative that sees two trees planted for every one used, based on the weight of paper-based products customers buy at Officeworks. Through the initiative, more than 200,000 trees will be planted every year to help conserve and restore priority Australian landscapes in our Southern Australia and Tasmania Island Ark programs. This creates a measurable difference for our native plants and animals, improves water quality and boosts local economies through the creation of new jobs. Australians can make a positive difference and get involved by purchasing from about 8,000 paper-based products sold in-store and online at Officeworks, which will make a significant contribution towards achieving the organisation’s long-term sustainability commitments. Visit www.restoringaustralia.com.au for a full list of products included. Restoring and conserving priority Australian landscapes. Improving and creating habitat to reverse the decline of threatened species including the Eastern barred bandicoot, Eastern quoll and Eastern Bettong, Regent honeyeater, Swift Parrot, Corangamite Water Skink and Brolgas. Enhancing biodiversity, by restoring existing bushland to buffer and reconnect key areas of habitat and improving shade and shelter on farms. Facilitating climate change adaptation and carbon storage. The partnership also provides a unique opportunity to reach a new audience, helping to increase awareness of our work and brand, and the value of maintaining a healthy environment. We are so proud of Restoring Australia, because it'll be doing just that, restoring and conserving landscapes across the country. Officeworks has a duty to operate our business responsibly and this initiative is our long-term commitment to making a positive difference to the communities where we live and work.